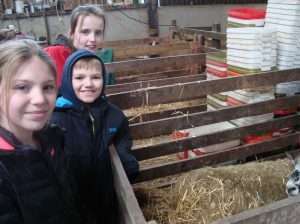 On Tuesday 22nd March, Year 5 visited Matfen Farm in Northumberland as part of their work with the Country Trust. The children were there to learn more about farm life and lambing in particular. Although it was early in the lambing season, the children were lucky enough to see three lambs being born. The children met with the farm’s shepherd, Malcolm, who told them all about the process of lambing and the children were allowed to feed the sheep and look at the lambs that had already been born. As well as the opportunity to visit the lambing sheds, the children were also able to walk around Matfen Farm estate. The farmer owner, Lord High Blackett, let the children eat lunch in one of his barns on hay bales! Year 5 also hunted for moles and took part a pond walk, where they looked at the creatures that made their homes in the pond. The children then got to visit Matfen’s tiny parish church, Holy Trinity Church, built in 1842 by Lord Blackett’s ancestor, Sir Edward Blackett. They were able to explore the church and the graveyard and two lucky children even got to ring the church’s bell! It was a fantastic day and gave Year 5 an experience like none they had had before. Thank you to Lord Blackett, Mr Thompson, Malcolm the shepherd and all the Country Trust for allowing us to visit and for teaching us so much about farm life.